London Printing 1853 (July 1): 5 c. red-brown on deeply blued paper, wmk. pos. 4 (rare), the used block of four with large even margins on three sides and touched into the design at left, ironed horizontal bend and corner bend, neatly cancelled by four strikes of the six bar target handstamp in black. 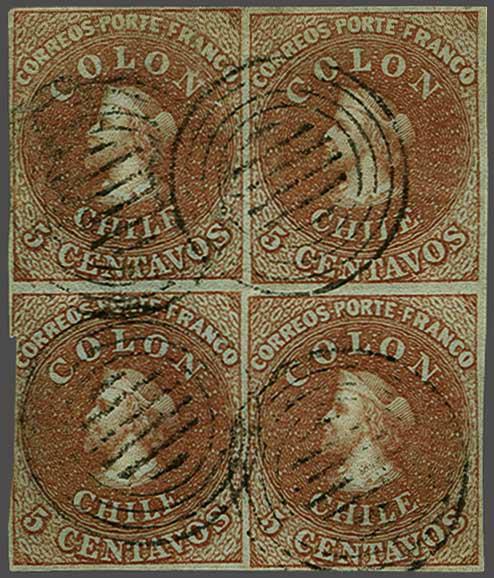 A very scarce multiple with just three used blocks of four of this stamp recorded, all of which have imperfections. Rare and, with wmk. position 4, unique.rnProvenance: Collection Joaquin Galvez, Corinphila sale 62, May 1979, lot 3021; Collection 'Islander', Corinphila sale 95, Dec 1994, lot 774.